Click on the photo to see a full size image. DeWayne "Tiny" Lund, winner of the 1963 Daytona 500, drove a Winged Dodge Daytona for Canadian team owner John McConnell 5 times during the 1970 NASCAR Grand National season. Twice Lund was able to finish 4th -- in the Daytona Twin 125 and the World 600 at Charlotte. 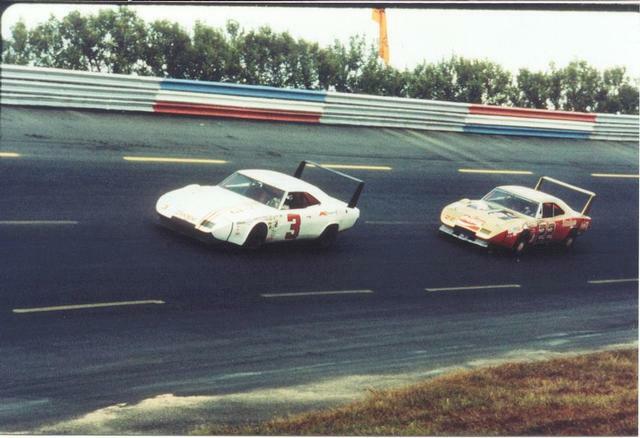 Bobby Allison #22 and Marty Robbins #42 battle side-by-side during the 1970 National 500 at Charlotte Motor Speedway. Robbins was making a return to racing following a two-year absence due to heart bypass surgery. 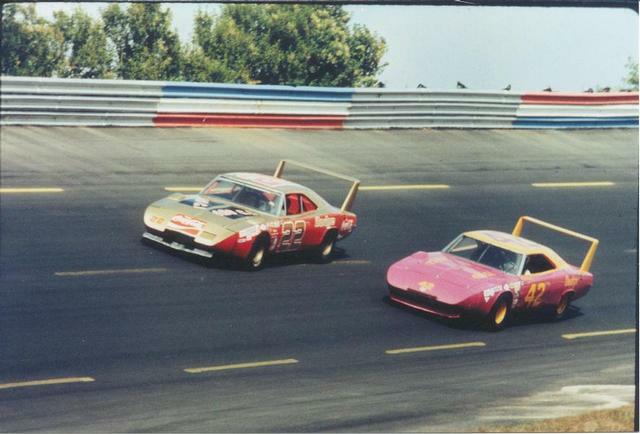 The Charlotte event was the only race in which Robbins drove a Winged Dodge Daytona. 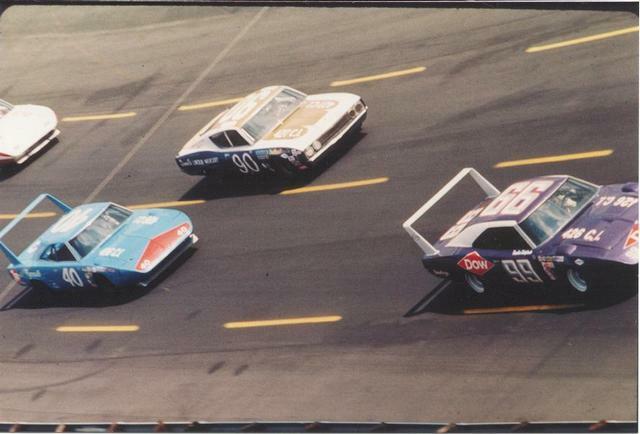 Charlie Glotzbach #99 and Pete Hamilton #40 sail down the straightaway as they buzz past Bill Dennis #90. Hamilton drove his Winged Plymouth SuperBird in 15 races in the 1970 season, winning 3 times. The youngster from Dedham, Massachusettes won the Daytona 500 and swept both events at Talladega in the only season he drove for the Petty Enterprises team. Fred Lorenzen hooked up with master mechanic and team owner Ray Fox in the second half of the 1970 NASCAR Grand National season. Although the team was foiled by sour luck, Lorenzen did win one pole (Atlanta) and scored a season-best 3rd place finish in the 1970 National 500 at Charlotte Motor Speedway while driving the white #3 Dodge Daytona. 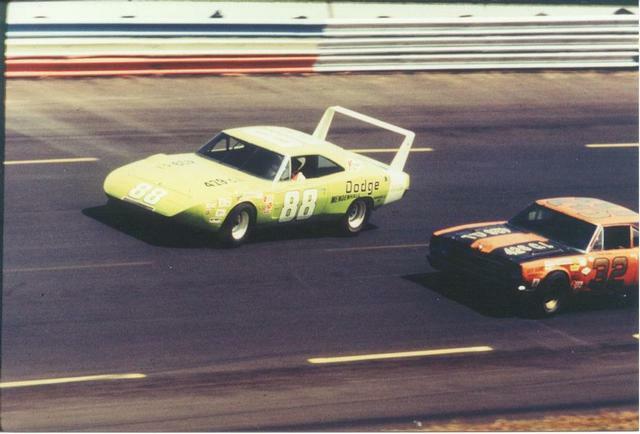 Richard Brickhouse, who won the inaugural Talladega 500 in a Dodge Daytona, drove a #88 Winged car in the 1969 National 500 at Charlotte Motor Speedway. Brickhouse drove a Wing Car only 6 times, but registered one win, a 5th place finish and a 6th place effort in the advanced aerodynamical machines. 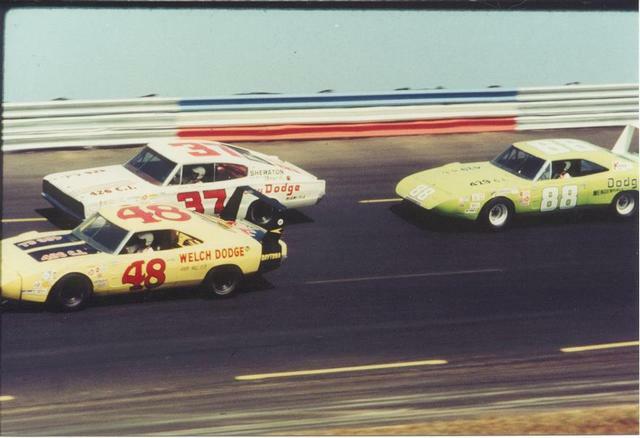 James Hylton #48, Dr. Don Tarr #37 and Richard Brickhouse #88 battle in close quarters during the 1969 National 500 at Charlotte Motor Speedway. 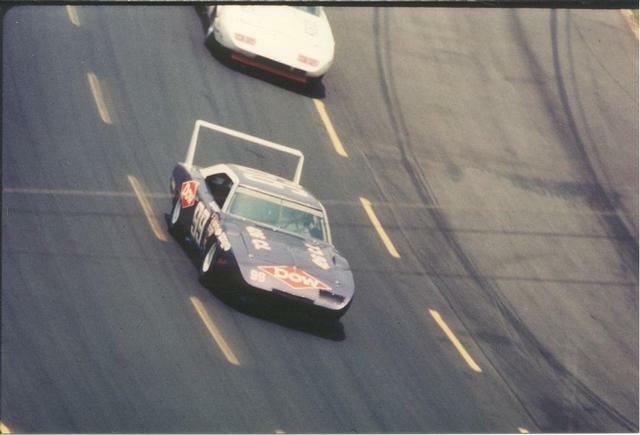 Hylton and Brickhouse were in the new Winged Dodge Daytonas, which made their debut 4 weeks earlier at Talladega. Tarr was driving a 1967 Charger model. Hylton drove his Winged Dodge only 3 times, with a best finish of 4th in the inaugural Texas 500 in 1969. 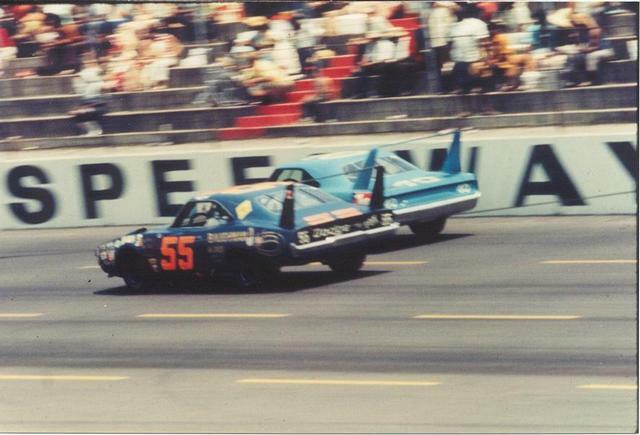 Charlie Glotzbach wheels his Ray Nichels Engineering Dodge Daytona into a high banked turn during the 1970 NASCAR Grand National season. Glotzbach's purple Dow Chemical Co. 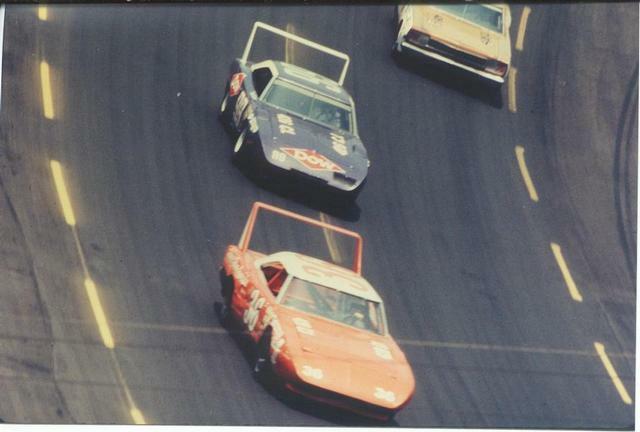 Dodge Daytona won twice during the 1970 season -- in the Daytona Twin 125 and the August 400-miler at Michigan. Chrysler Corp. designated the official color of Glotzbach's car Plum Crazy, but members of the media nicknamed the color Statutory Grape. 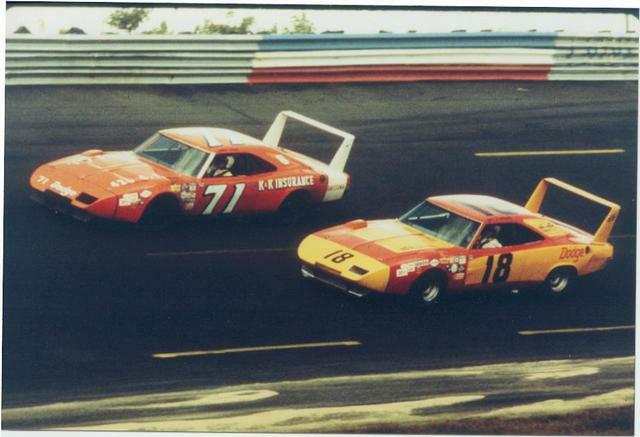 Bobby Isaac wheels his #71 Dodge Daytona around Joe Frasson #18 at Charlotte Motor Speedway in 1970. Isaac captured the 1970 NASCAR Grand National championship on the strength of 11 wins in 47 starts. Frasson was a rookie in the 1970 season, scoring 2 top 10 finishes in 21 starts.